2017 KTM Duke 200 Launched @ Rs 1,43,500! KTM India has just launch the new 2017 Duke 200. The new KTM Duke 200 for India is BS-IV compliant and comes with fresh graphics. Unlike what was rumoured, the new Duke 200 doesn’t look like the new 2017 KTM 390 Duke. The Duke 200 has achieved an almost stellar success in India. Thanks to its powerful engine, sharp handling, attractive pricing and a decent sales network, the baby Duke has been quick with finding a lot many takers. 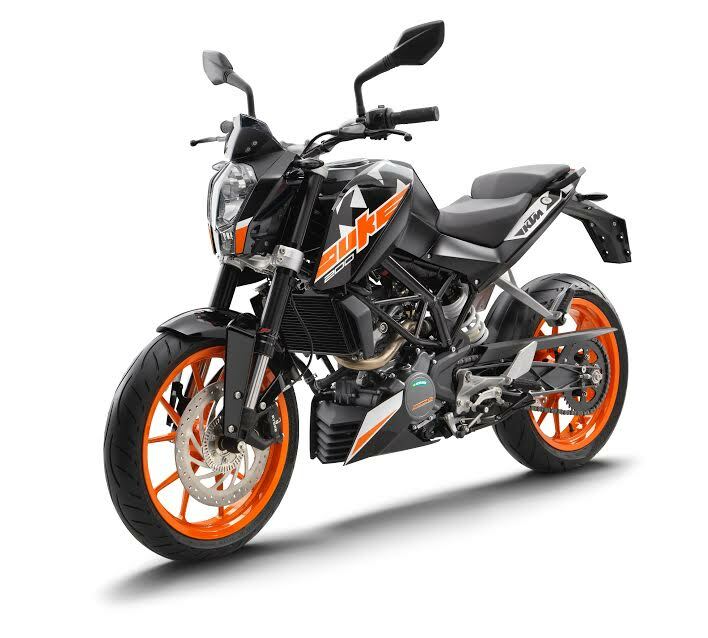 Now, in all probability, the 2017 KTM Duke 200 will consolidate this motorcycle’s position in our market. Read on for details on price expectations, specifications, mileage and top speed. The new Duke 200 features the same 199.5cc, single-cylinder, liquid cooled engine that powers the current bike. It outputs 25 BHP and 19.2 Nm. Transmission duties are courtesy of a 6-speed Manual gearbox. 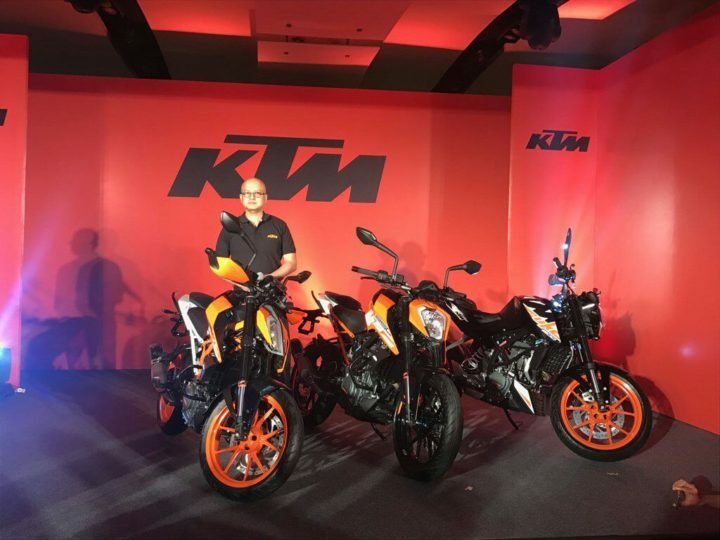 KTM India dealers are accepting the bookings for the new bike. We request you to contact you nearest dealership for booking and test drive related queries. The 2017 KTM Duke 200 is priced at Rs Rs 1.43 lakh (ex-showroom New Delhi). There has been no price increase with the launch of the new model. The 2017 Duke 200 shares its engine with the current model. However, the new motorcycle’s engine is BS-IV compliant. It outputs a max. power of 25 PS. ABS is not available even as an option. There isn’t a noticeable change in the bike’s fuel mileage. 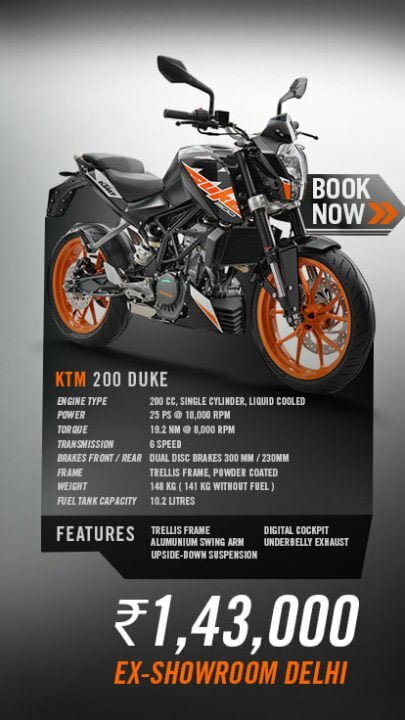 The 2017 Duke 200 offers around 35 KMPL under normal usage. The 2017 KTM Duke 200 is expected to have a top speed of around 145 KMPH. Stay tuned to CarBlogIndia for news on new 2017 KTM Duke 200 India price, specifications, mileage, top speed and images.